Just imagine... it is 2:50am. You have just stumbled out of Mr. Ed's after listening to Dot Dot Dot and you have some SERIOUS munchies. You are walking back along the building towards your hotel room and you see a golden shining light! On the side of the building at the entrance to the Commodore. What is it? Why yes, it is the bright shiny Subway neon! And they are still open!!! And at 3am, they are pretty much the ONLY ones still open at that hour, and a respectable chain franchise restaurant on top of that so you know you are going to get something good. Or are you? Psych! Yes, this Subway rocks! Even for those of us on a diet. Subway offers 7 different sandwiches for 6 grams of fat or less. These sandwiches are 6" long and mostly have deli meat in them like turkey, ham, roast beef, etc. Most sandwiches fall in around 220 calories so you can get filled up without getting plumped up. Add in cheese and some light mayo for a lil more oomph. That usually keeps me going all night until I happily pass out in my bed. And recently (ok, within the past year) Subway has added some new sauces (red wine vinaigrette, sweet onion teriyaki, honey mustard) that you can have on any of their sandwiches so that you can create a much larger variety, when you add in all the bread selections. OK, so we all pretty much knew that from all their advertising and gimmicky marketing. But how do the subs really taste? First off, let's start with the good. The veggies are excellent. I am not typically a huge fan of piled-on veggies, but there are tons to choose from here including my favorite black olives, awesome dill pickle slices, and even hot peppers (good for the metabolism!). All of the vegetables are fresh tasting and are very good but I would avoid the cucumbers as they always look frozen on the side of their little bucket. Nothing fancy here... you're going to get iceberg lettuce, but based on all the Subway's I've been to, you're almost guaranteed fresh veggies as they come in vacuum-packed and sealed. The sauces also are very good. You can add a lot to a sandwich just by asking for some mayonnaise, or one of their low fat, low calorie sauces. I prefer plain ol' yellow mustard, light mayo, and some salt and pepper. The meats are ok. They do the job, but there's nothing super special about them. They're about the same as what you'd get from the sliced meat department of your local grocery store but once again, they are very fresh tasting as they have high turnover so it does not sit ourin the air (ie oxygen) too long. The bread is where things go a little downhill. The bread is typically very dry and not as smooth tasting. Even though it is baked fresh every day and sometimes you can even get it fresh out of the oven while it is still warm, it is still a bit dry and brittle. I am going to go out on a limb and guess that this is due to their commitment to a low fat low calorie bread. This will typically make the bread drier and brittler since there is not enough lubrication in the dough. Even though I understand this, it still kind of hurts the overall experience for me (thus, not 10 stars). There are usually 6 types of bread that are available. These are white, wheat, Herby, Cheesy, Hearty Oat, and flatbread. Subway is also open early for breakfast, but I have not gotten up that early yet to try them out. 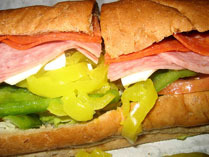 You can reach Subway by calling 419.285.1000. 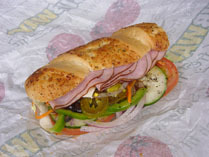 You also can follow them on Facebook at http://www.facebook.com/subway . Notes: if you see Jared here, they are filming a commercial!